Imagine waking up to the sounds of the waves lapping at the shore near a sleepy little fishing village in a paradise island. You don’t have to imagine because this is how your days would begin at Mosvold Villa. Although perfect for a big family vacation since the Villa can accommodate 24, couples wishing for some privacy will not be disappointed with what Mosvold Villa has to offer. Each of the bedrooms at Mosvold Villa, are equipped with a luxurious king sized four-poster canopy beds or two single beds allowing for maximum relaxation. For the newlyweds, Mosvold Villa offers a Honeymoon Suite isolated from the rest of the house giving total privacy to create your romantic sanctuary. With a plunge pool and a private verandah with sun beds, you can easily forget the outside world. For those who want to be closer to the ocean and soak in the sun, the beach is just a step away from the Villa. When you’re tired of the ocean, if that is even possible, you can come back to the pool, sip a freshly made drink and still watch the ocean in front of you. 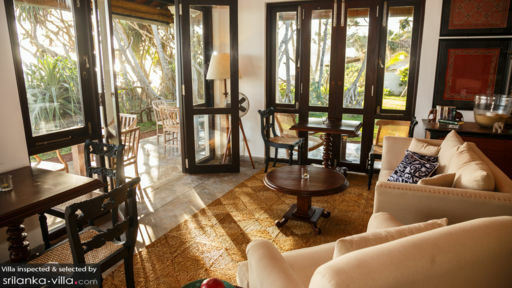 At Mosvold Villa, you have a choice between relaxing at the open plan veranda giving you plenty of vantage points to try and capture the best view of the ocean or settling into a comfortable couch inside for a temporary retreat from the sunshine and the tropical weather. With free Wi-Fi and a flat-screen TV in each room, you may not even need to step out of your room. But if you decide to step out, Mosvold Villa offers a personal butler service to design your day any way that you want. 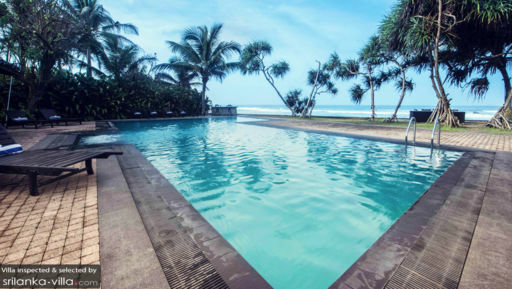 For the daring travelers who are willing to tear themselves away from the indulgence that Mosvold Villa offers, the Villa is conveniently placed to access various sight-seeing opportunities including the UNESCO world heritage site of Galle Fort, the Yala National Park, Sinharaja Tropical Rainforest etc. True 5-star experience. We just wanted to stay forever. The best 4 last days spent in Sri Lanka, we couldn't imagine it better. From the welcoming - received us with local flowers and big smiles, we had to light a candle for the poya (full moon) at the reception of the villa. We felt really special and immediately understood that these last days are going to be fantastic experience. After a refreshing cold towel, they showed us the room - the best one according to us, as it is like we had our own villa, closest to the beach with our own terrace and amazing view to the beach and the ocean. No alcohol during the first day because of the Poya but in the evening, there was no problem. Great food and selection of wines. The personnel was really helpful and greetings to the cook as we didn't want to eat anywhere else after we tried his meals. Service was just excellent. We enjoyed 10 minutes welcoming massage and 15% discount for the spa. The garden, the beach and the pool were incredible - you can enjoy whatever you want - from swimming, surfing, just enjoying the beach. We went to Unawatuna one day just to explore the beach we quickly realized that our beach is just 10 times better. It was just the perfect picture place, so relaxing! Without tones of tourists and annoying kids - definitely in my top 5 list! They were cleaning our room twice per day and prepare us the room before going to bed. We had water bottles every day and chocolate flatteries every night :) I just regret that we couldn't stay more. The personnel was happy to arrange us a daily room before catching the taxi at 9 p.m. for the airport. They have also organised it for us and we didn't have to change our room. The most beautiful setting right by the ocean. Quiet and understated with extremely friendly staff and very attentive. I really don't have anything to fault. Everything was truly exceptional! From the facilities, the staff, the service, the location, the beach, and the food oohh this food. You really cannot find easily such a high level of cuisine, and not talking locally, but worldwide, and that comes from someone that travelling day by day. Mosvold villa is all about absolute relaxation, away from crowdness, with an amazing beach at your feet that feels almost private. Very close to the city of Galle which is also really worth visiting. Everything was great, and we hope we can find ourselves there soon again! Still have questions? Call us now! 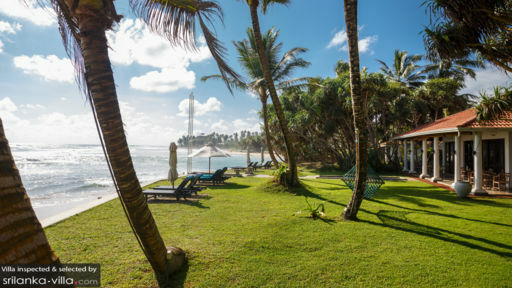 Copyright © 2019 SriLanka-Villa.com. Call us in Singapore +65 6871 8993 / Australia 1300 014 384 or +61 2 9191 7419.